For 2016, IGX continues its tradition of supporting ongoing HEMA tournament formats while piloting new formats. The majority of our tournaments (e.g. Longsword, Mixed Weapons) will continue to adopt the modified Nordic rule set from 2015. This year our experimental efforts will focus on our Dagger tournaments, as well as the return of a Cutting event! In addition we will evolve both the breadth and depth of our combative tournament structure. Tournaments will now be broadly classified by weapon size: Short-, Mid-, and Long-range. Each tournament will be Open to all genders and ages by default, and assume the following default weapons: Short = Dagger, Mid = Mixed Weapons (generally sword in one hand), and Long = Longsword. Really, no immediate difference compared to last year — the motivation is to allow us to introduce and exchange different weapon forms as Track options for each tournament going forward. Speaking of that, this year we are introducing the concept of Tournament Tracks. The concept: if there are enough competitors interested in a given Track within each tournament (e.g. Women’s, Saber, Wisdom League (see below)), we will make every effort to put those competitors into Track-specific pools during the initial tournament rounds. The results of these Track pools will be used for ranking in both Track and Open Tournament eliminations seeding. In other words, this will allow competitors the option of competing solely within their chosen Track (culminating in its own final), or move on into the Open element of the tournament, or both! While most Tournament Tracks will be weapon form-specific, two Tracks are distinct from this. The first is the Women’s Tournament Track — just as in the past where we have encouraged the growth of Women’s participation in HEMA, we will continue to do so this year. The second is what we are calling the Wisdom League: a Tournament Track similarly designed to encourage the growth of tournament participation by HEMA practitioners with at least 50+ years of life under their belt. ….This was the grand plan, until we ran the numbers based on registrants’ feedback and, well, the results surprised us! Of those who responded for mixed weapons the most number of people in any given track was…3. Many different weapon types were suggested, but there was clearly very little consensus of what type of mixed tournament tracks we should have. This in a way is a good thing, it helps keep the already tight schedule from exploding with too many options. Also, it shows what a flexible and eclectic bunch you are! With that in mind, we have decided to forego the idea of Specialized Tournament Tracks in the Mid-Range category only. We will instead have a system similar to previous years: an Open Mixed Weapons tournament with the weapon of your choice (so you could fight someone with mixed or matched weapons, you decide) and one to two smaller matched weapons tournaments, separate from the Open. The scores you receive from these smaller tournaments will NOT be incorporated to your total score in the Open. Right now we’re leaning toward Sword & Buckler and potentially Sabre. Final decisions will be made in a few weeks so stay tuned! Short-Range (Dagger): Fighters will participate by weight class, and will fight using a customized IGX dagger ruleset. Cap of roughly 30 fighters. Mid-Range (Mixed weapon): Fighters will use the modified nordic rule set for a wide array of single-handed swords (steel preferred, nylon may be allowed if no steel equivalents are available), details on the equipment requirements page. Cap of roughly 30 fighters. Long-Range (Longsword): Typically the golden standard of HEMA competition, this event format will feature steel longswords with the modified nordic rule set. To help raise the bar for both competitors AND judges, fighters should expect to be asked to judge at some point. Fighters also will NOT be allowed to participate in both the Basic and Advanced events — they may choose only one. Cap of roughly 60 fighters. 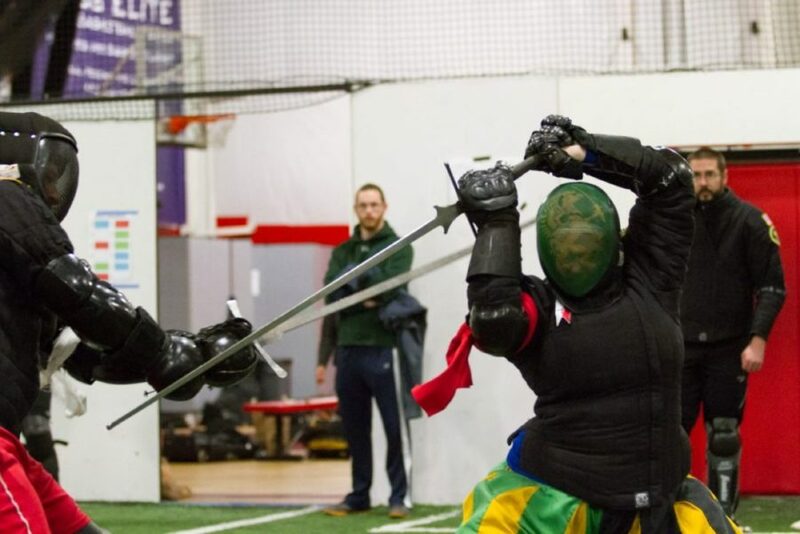 Long-Range (Longsword), Coached: Because the goal of this tournament is to help expose newer HEMA students to longsword competition, this will be treated like a specialty that is kept separate from the rest of the Long-Range tournament. Competitors will not be able to participate in the Open format above, but will able to advance to a set of eliminations and finals specific to this specialty (just like IGX 2015 Basic Longsword tournament). Fighters can expect to get more feedback from both coaches and officials to help develop competitive HEMA skills. Cap of roughly 30 fighters, rules identical with the Open Long-Range tournament (modified nordic rule set). Cutting Tournament: The return of this skills competition will feature innovations from other cutting tournaments around the country and continue some of the unique elements of the IGX event. Our focus remains on challenging the competitors to demonstrate cutting skills in applications more like cutting in combat, including movement, measure, and reaction based feats. Basic Qualifications will also be included.